Powertools and the bedroom | Planet Geek test site. Nice work! 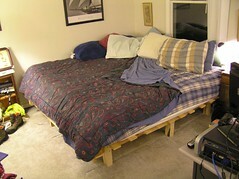 I miss having a boxspring and frame, but I suspect a futon frame might be a good solution for me as well. Nice use of a MISLEADING TITLE. Yes, it is good to get the bed off the floor. I’ve had to do the “on the floor” thing too often in my cranky life and my 44-year-old back now demands that I have a chance to fall out of bed, rather than having to crawl to a doorknob. All hail TooBahFor, the God of Lumber! Yeah, I should have scrolled up, dag nabbit. I saw that AFTER the wittiness. Help us help those with post-witty regret. Please give generously now. Well this post is well after the fact, but I’ve fumbled around with few futons in my day. The couch / bed concept is still worth noting!